Roberto Mamani Mamani, of Aymara origin, is one of the Bolivia's most highly recognized artists. His beautiful and very colorful works of art are collected and exhibited worldwide. He has won numerous national and international awards and his paintings are known best for their vibrant colors and the intense emotions they both exude and evoke. His parents, both from highly respected Aymara families and lineage in Tiahuanaco, had been forbidden to marry and ran away to the department of Cochabamba (a mostly Quechua region) where he was born in December, 1962. Throughout his childhood Mamani observed the environment and sketched it in detail and states those were some of the happiest times of his life. He remembers vividly being the only Aymara family in the area. When he was 5 years old he was sent back to Tiahuanaco to live with his grandparents. His grandfather was an Aymara chieftain and his grandmother taught him about the importance of his people's history and encouraged him to continue painting and drawing, bringing his Andean culture to life. It was his grandmother who instilled in him a deep love and respect for the ancient customs, traditions, legends, and knowledge of the Andean peoples and here his art truly flourished. Because the land of his birth and the land of his people both greatly influence his art, Mamani considers himself both Quechua and Aymara. Eventually Mamani Mamani went on to study agronomy and law at the University of San Andrés in La Paz, but his first love was his art. Having no resources to buy proper art paper, he continued to paint and sketch on newspapers while he studied. Attending university caused him much internal conflict as he struggled to find balance between the Western cultural values and politics he was being taught while maintaining his indigenous identity. Gradually, he says, "the color emerged in me to keep away the bad spirits and to not stay in darkness. The energy of the Andes, of Tata (Father) Sun and Mother Moon and the sacred Pachamama (Mother Earth). The coca leaf arose in all my being, a being of hope. Mamani Mamani turned into color through light." Mamani painted profusely during this time and never turned back. Roberto Mamani Mamani's works of art all contain elements of Andean culture. The colors he uses have specific meanings and represent parts of his culture and the folklore and beliefs of his people. In his paintings, yellow suns are male, pointed mountains are male, rounded mountains are female, blue moons are female, horses (brought to the Americas by the Spaniards) represent the colonization and enslavement of his people, and so on. Each piece tells a story and each color and shape is specifically chosen to represent part of that story. Mamani also paints in series (women, archangels, grandmothers, llamas, suns, mountains) and other sets. 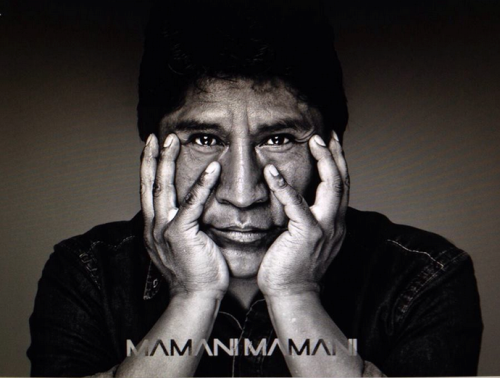 Many years have gone by and today Mamani Mamani is probably the best-known Bolivian artist worldwide. However, poignant is the fact that Mamani still sketches on newspapers - so as to not forget his roots and accentuate the poverty in which his people still live. You can view and purchase Mamani's artwork at the many galleries in which his works are exhibited, where you'll find original works, posters and prints, calendars, postcards and cards, mugs, T-shirts and other items with his beautiful paintings. The artist works only with natural paints, mostly natural pigments which he creates and mixes himself. Even the oil paints he uses are natural. He has special papers imported from France and also paints on canvas. Today Mamani travels worldwide and is frequently not in Bolivia. However, when he is he takes the time to participate in exhibits and other events to promote the arts, and even visits local schools to encourage children to pursue their artistic vision.